Home » General Info » Is Rheem The Best Tankless? A fellow tankless writer over at atanklesslife has been immersed in the tankless industry for a number of years now. He (or she) has a great grasp of tankless pros, cons, and common home owner issues. They probably don’t realize but we here have all been reading their posts for some time now. I’m calling them out a bit but I respect the work they do and would be very interested in getting their take on the current Rheem tankless water heaters systems. I hope they are able to reply to this with a post of their own. I have always recommended Rinnai as my number one manufacturer of tankless systems for home owners, but mostly due to the systems reliability. 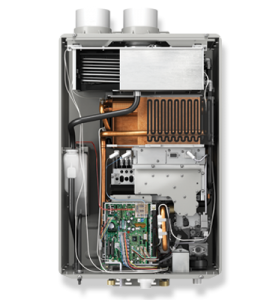 A big part of the reliability is that here in Ontario Rinnai only sells tankless systems to certified installers who have taken the Rinnai installation course. This ensures that the tankless water heater is installed correctly, nearly every time. In a study by Consumer Reports on furnace installation they found that improper installation, inadequate maintenance, and human error were the primary reasons for system failure (Consumer Reports, 2012). I realize this is for furnace systems but it’s not hard to extrapolate these results over to the tankless industry. Thus, Rinnai may very well not have the most reliable tankless on the market, just the best installers. A Tankless Life, located in the USA sells and ships tankless water heaters over the internet. I would presume that a good portion of their clients are home owners looking to upgrade and install tankless water heaters themselves. This puts them in a great postion to answer my question on what they feel the best tankless manufacture would be? What do they recommend as their go to brand? Does that match their best selling unit? I’ll be certain to update this post should I receive a response. Consumerreports.org. “Gas furnaces.” 2012. Web. 20 Mar 2013. <http://www.consumerreports.org/cro/appliances/heating-cooling-and-air/gas-furnaces-703/overview/index.htm>.